Cincinnati, Ohio Health Care Fraud Lawyers - Oberheiden, P.C. Cincinnati has become a center for health care fraud investigations. Health providers in Cincinnati, Ohio and health businesses such as hospitals, pharmacies, laboratories, home health and hospice agencies, must understand that the federal government is intensively and aggressively pursuing investigations in the Cincinnati area resulting in license revocations, raids, arrests, and criminal prosecution. Federal authorities such as the U.S. Department of Justice (DOJ), the Drug Enforcement Administration (DEA), the Department of Health & Human Services’ (DHHS), the Office of Inspector General (OIG), and the Medicare Fraud Strike Force, were formally instructed by the Attorney General of the United States to seek the maximum punishment for any federal law violation, including health care fraud statutes. Further, while previously investigations centered around Medicare and Medicaid Fraud, new task forces have significantly expanded their focus to include alleged fraud against private insurance plans. Effective and experienced legal advice and defense skills are now more important than ever and the difference between experimenting and knowing how to handle a health case can be as severe as continuing your business or ending in federal prison. Oberheiden, P.C. offers clients in Cincinnati, Ohio the experience of more than 1,000 health care fraud investigations, hundreds of grand jury investigations, hundreds of Medicare audits, several decades of Department of Justice work history, and a team of professionals that is focused on advising and defending health providers to protect their license, livelihood, and freedom. If your business or practice is at risk due to allegations of health care fraud, then we urge you not to experiment; instead, put lawyers with a proven track record at work for you. Our Cincinnati health care fraud attorneys provide full-service legal representation for all health fraud-related matters. If your business or practice is facing an audit or investigation, Oberheiden, P.C. will navigate you through the process. With hundreds of cases similar to yours already performed, clients from across Ohio, including all areas of Cincinnati, know that they can expect reliable advice and proven solutions. Call today to have a former federal prosecutor assess your case. The fraud charges in Cincinnati include Medicare Fraud (18 U.S.C. 1347), Medicaid Fraud, as well as violations of the Controlled Substances Act (21 U.S.C. 841), the Anti-Kickback Statute (42 U.S.C. 1320a-7b), the Stark Law Statute (42 U.S.C. 1395nn), and the federal False Claims Act (31 U.S.C. 3729-3733). Opioids & Narcotic Diversion. It is no secret that Cincinnati and other major cities around the country are experiencing a dramatic increase of prescription investigations since Attorney General Jeff Sessions declared the war on pain medications in late 2017. Headlines of prosecuted doctors shock the medical community. In this climate of investigations, Cincinnati medical providers and pharmacies need to make a decision: do I risk being the next target (regardless whether you yourself consider your practice to be legitimate) or do I seek professional guidance to protect or defend me? Medicare Audits. There are several types of Medicare audits. In general, Medicare Administrative Contractors (MACs) and Recovery Audit Contractors (RACs) work to identify improper payments though a process of reviewing and analyzing claims data in addition to medical documentation that is obtained from the member/provider. Many times this involves a statistical sampling of files in order to establish an error rate. Another type of Medicare audit is conducted by the Zone Program Integrity Contractors (ZPICs). ZPIC audits identify and stop potential fraud and refer these cases to the Department of Health and Human Services (HHS) and the Office of Inspector General (OIG). The risk with Medicare audits is that a mishandled audit can lead to a referral to the U.S. Attorney’s Office. Oberheiden, P.C. knows how to avoid this. Former Department of Justice health care prosecutors with first-hand knowledge of the process navigate our clients through the audit and make sure that they can continue their business and don’t need be worried about their license or a government investigation. Medicare Fraud, Medicaid Fraud. Cincinnati medical providers and health care industry companies are most often charged with Medicare Fraud or Medicaid Fraud, typically pursuant to 18 U.S.C. 1347. According to that statute, a conviction in a criminal case may result in years of federal incarceration. Oberheiden, P.C. has a track record of resolving billing, coding, physician certifications, claims submissions and other Medicare and Medicaid issues with no civil and no criminal liability for our corporate and individual clients. If your practice is subject to a federal health care investigation, you should immediately consult with experienced attorneys. Don’t allow the government time to build a case against you. Often, what begins apparently simple as a ZPIC audit, OIG subpoena, or other form of governmental inquiry, can quickly get out of control. Don’t let this happen! Illegal Kickbacks. The Anti-Kickback Statute penalizes the knowingly soliciting, paying, and/or accepting any form of remuneration (e.g. cash, checks) to induce or reward referrals for items or services reimbursed by federal health care programs. When it comes to Anti-Kickback charges, nothing replaces experience and proven skillset. The key in kickback cases is to convince the government that perceived kickbacks either did not exist or are subject to important exceptions rendering potentially unlawful arrangements entirely consistent with applicable laws. Cincinnati Billing and Coding Violations. 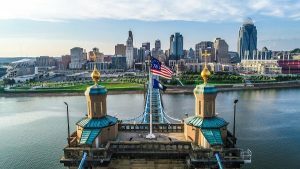 Cincinnati is home to many hospitals and surgery centers, toxicology laboratories, home health and hospice agencies, and large numbers of physicians billing Medicare and Medicaid. If your health care practice is being accused of billing for medically-unnecessary services, upcoding, unbundling, double-billing, or billing for services not actually rendered, you should immediately contact Oberheiden, P.C. to avoid civil or criminal prosecution. Physician “Self-Referrals.” The federal Stark Law imposes penalties for what are commonly known as physician “self-referrals.” Physicians are prohibited from referring certain federal health care benefit program beneficiaries to entities in which these referring physicians have a financial interest. Liability under the Stark Law statute can be astronomical. Similar to the Anti-Kickback Statute, the Stark Law includes various exceptions, and Oberheiden, P.C. has a track record of identifying relevant exceptions to protect our clients from liability. Call us immediately if you are concerned about your role in a case or if you are under investigation. As we have for so many others, Oberheiden, P.C. will find a way to protect you. Q: What types of health providers are being targeted in Cincinnati, Ohio? With the government’s aggressive stance on pain medication prescriptions and, more generally, health fraud, all Cincinnati medical providers and health companies must carefully evaluate whether or not they take the risk of “being next” or whether they seek professional guidance to avoid or strategically defend unjust charges. Oberheiden, P.C. has been hired by clients across the country, including clients throughout Ohio, to assist with the following entities and provider types. Q: What are some examples of billing and coding errors that can trigger federal health care fraud investigations? Health fraud, if not efficiently defended, can result in civil and criminal penalties, fines, license revocation, and incarceration. In the past, many health fraud cases were civil in nature and the goal of a defense lawyer was to avoid monetary fines or mitigate them to an acceptable level. Recently, there is a shift from civil to criminal prosecution and almost no day goes by without new physician arrests, licensure revocations, government raids, and sentencing announcements. Cincinnati is no exception to this trend. Because most federal health fraud statutes are criminal felony statutes, health providers, physicians, nurses, nurse-practitioners, business owners of pharmacies and toxicology laboratories, DME companies, home health and hospice agencies must make sound decisions when it comes to avoiding or defending potential fraud. Oberheiden, P.C. offers clients in Cincinnati and surrounding communities decades of Department of Justice experience with respect to health fraud and criminal defense matters. If your business or practice is being targeted in a federal health fraud investigation, you may want to consult with the accomplished health care fraud and criminal defense attorneys of Oberheiden, P.C. to assess, analyze, and resolve fraud allegations. Oberheiden, P.C. has successfully defended clients in complex health care investigations and government prosecutions involving Medicare Fraud, Medicaid Fraud, Tricare Fraud, False Claims Act, Qui Tam Defense, Stark Law Violations, and Physician Self-Referral Prohibitions across the country, including in Ohio. Call us today to find out how we would approach your case. Our team of Cincinnati health fraud defense lawyers is available to begin working on your case immediately. To speak with our attorneys in confidence, please call (888) 519-4897 or request a free case evaluation online now. Subject to our terms and conditions and in accordance with the applicable local rules of United States District Courts and state professional boards, the attorneys of Oberheiden, P.C. may accept engagements in federal cases relating to the following geographical areas either as already admitted counsel, pro hac vice, or in combination with locally licensed counsel: Cincinnati, Hamilton, Middletown, Fairfield, Covington, Mason, Florence, Independence, Oxford, Lebanon, Norwood, Forest Park, Erlanger, Springboro, Fort Thomas, Newport, Sharonville, Blue Ash, Wilmington, Loveland, Springdale, Maysville, Dearborn County, Franklin County, Ohio County, Boone County, Bracken County, Campbell County, Grant County, Kenton County, Pendleton County, Brown County, Clermont County, Hamilton County, Warren County, Butler County, Wilmington, Clinton County.